I have read a few articles about gender inequalities at home—where moms, including working moms, foist the bulk of household work onto their capable shoulders either due to lack of cooperation from spouses or their absence. 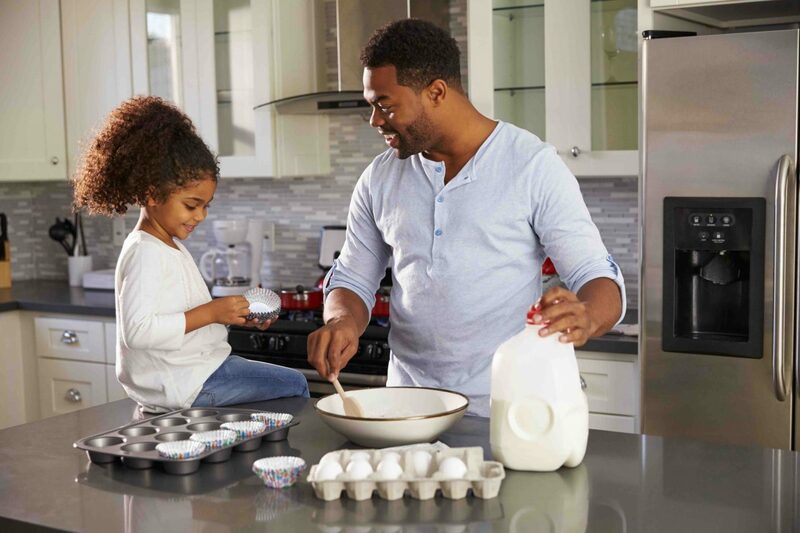 It got me thinking about how my husband and I split up household duties so that my sons and daughter see mom and dad working together. RELATED ARTICLE: Are You Becoming Too Busy for Your Own Marriage? When my husband and I were first together, before we got married, we talked about how we envisioned our lives in the actual day-to-day routine. As we were both lawyers, the days were filled with motions, appeals and paperwork. The evenings were divvied up with cooking, tidying and errand running. We fell into a pattern of who liked to do what, who hated doing something the least and who was good at what. We also did almost everything together because we were newlyweds without kids. Add three small kids to the mix and the paradigm shifted; since having children, I have decided to work from home. We are in a pattern now that’s working. Maybe you’re in flux of juggling work, little babes, tots and household duties? If so, divvying up the work between you and your husband can be helpful and productive. Here are a few helpful tips that worked for us. 1. List out what you love and what you hate. I love a good list. We each created a list and broke it into things we loved and things we hated. For example, I love cooking; my husband hates dealing with anything technological in the house. Once we had basic allocations of hates and loves, we knew we were in the ballpark of figuring this all out. I hate doing dishes at the end of the night. Basically, by the end of the day I hate doing anything except putting the kids to bed and retreating. Any household work that needs to be done after seven isn’t going to be done by me. He loves late night Target and grocery runs on Sunday nights. This is a good time for him to make a few phone calls, clear his head and get prepped for the week ahead. I don’t do everything despite being the one who’s home all day. This is in part because, although my role as a wife and stay-at-home mom is to do the best I can, it’s not to be a servant. I want to make things nice for my husband, but I also want to stay sane. Some things I reserve for him and some things I set aside because I know the tasks will be fun for him to experience with the kids. It’s good for the kids to know the house is all of ours and we all tend to it, even if I’m the one mostly in it. I’m home twelve hours without him during the day. That’s sometimes a really long day. But when he crosses the threshold, he is dad. His dinner is ready and the kids have already eaten and the house is only sometimes a hurricane. He gets an hour and a half with them, and brings the tot to me when he’s ready for bed around seven. It’s a block of time in the evening where I can do anything or nothing at all. Conversely, on weekends, I take the kids to their morning activities and my husband hangs back and plays with the little ones who aren’t bopping around. He goes for a run or two on the weekend. We enjoy family time mostly on Sundays and that’s great, too. When the kids see their father not just as “fun” but also the guy who’s cleaning up and fixing meals and dealing with their temper tantrums, it gives me—as primary caregiver—a little extra credence. I’m not as fun as Dad, but he’s just as good at dealing with their sometimes reckless behavior as me, albeit less beaten down by it and probably approaches it with a fresher eye and ear. We aren’t designed to do it all. We can’t run homes, businesses, jobs, kids’ schedules, education, keep marriages alive, stay centered spiritually—on our own. We have family living with and near us. They bear the brunt of babysitting and extra hands for big projects. My dad is a regular at Costco mostly for me and the kids. My mom babysits constantly. It got me thinking about how we divvy up household work, so that my sons and daughter see mom and dad working together. Maybe you should hire a cleaning service, have a babysitting swap or have your groceries delivered. 4. Insist on sharing the fun stuff and the bad stuff. I don’t share, or hog, everything. I don’t reserve all poopy diapers and cloth diaper cleanings for my husband to handle. Equally, I don’t hog all the good snuggle time and sweet moments of motherhood either. For example, my husband does bedtime with the two older kids every night, while I put the younger ones down. 5. Someone always has to empty the trash. Now that our oldest is five and a half and tall for his age, he’s getting really good at helping take the trash out. No, he can’t reach the cans with the heavy bag or swing it over his shoulder, but he can get every item of garbage to the back step. But someone has to put it out in the bins. And I’ve figured that because someone has to do it, it’s kind of a metaphor for running a household. No one person will always do one job. Even when it’s not on my column of things to do, someone has to take out the trash. If we leave it on the step too long, our vagrant squirrels will shred into it. Sometimes I take it to the bins, and sometimes my husband does. Sometimes we give each other withering glares about it. And that’s okay too. Not all chores are going to be equal.